If you're like me, you spend a fair bit of time looking at photos online, seeking inspiration for your own work. This is a beneficial practice regardless of the type of photography you're most interested in doing. 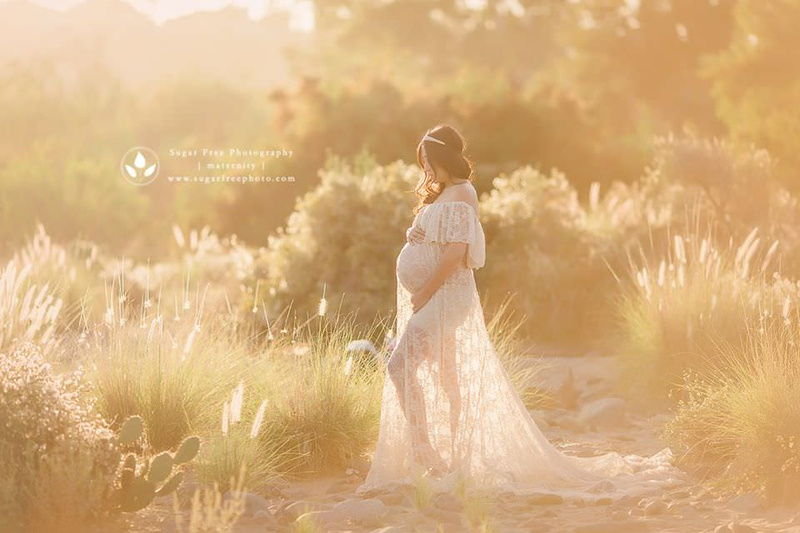 When it comes to maternity photography, finding inspiration is pretty easy to do because there are a lot of great examples of how to make an expecting mother look beautiful. 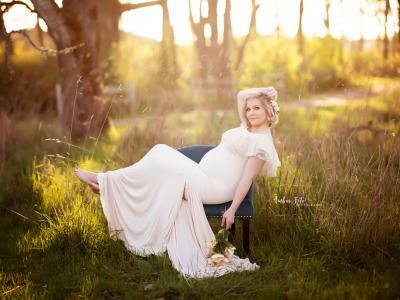 Of course, the problem with finding so many examples of gorgeous maternity photography is that it's pretty easy to then look at the photos you take and think, "Gee, my photos aren't nearly that good." Fortunately, there are a few simple and easy steps you can take that will make your maternity photos shine just like those that you admire on the internet. 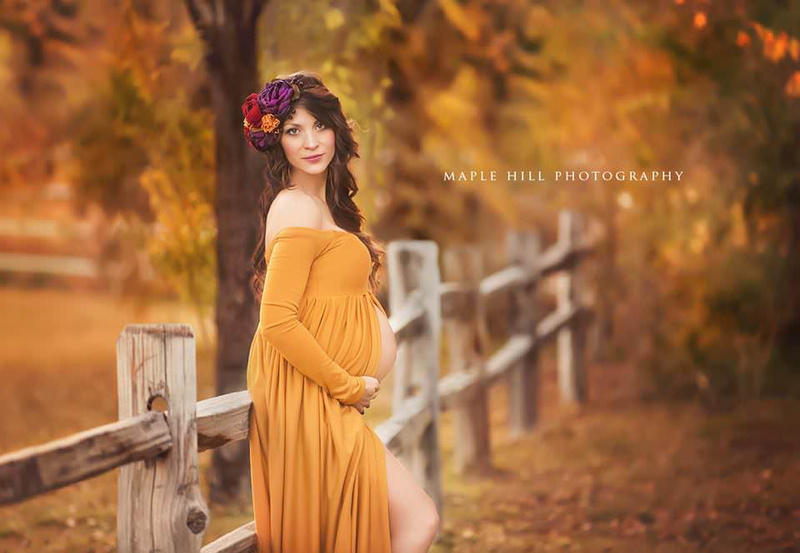 If you want to take your maternity photography to the next level, consider these tips. Keeping your maternity photography natural can mean a couple of different things. 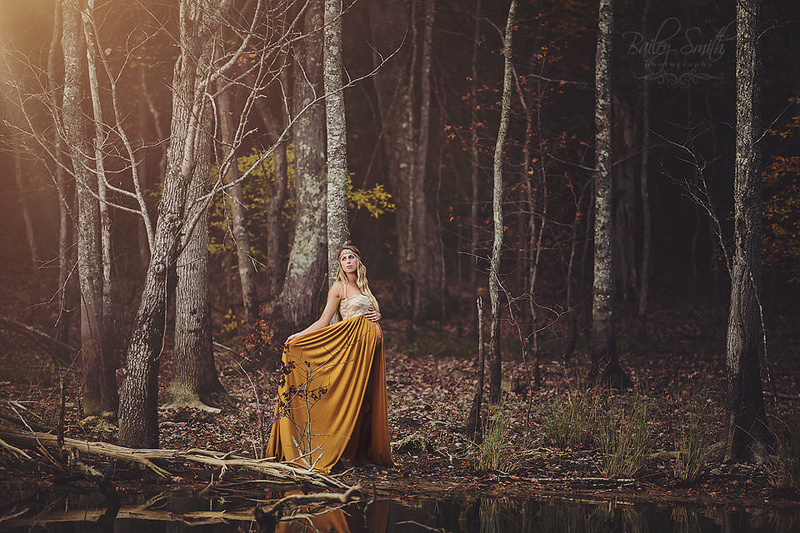 First, outdoor maternity portraits can be more visually impactful because you can incorporate so many natural elements that give the photo improved depth and drama. In the image above, you immediately notice the soft, golden sunlight, which gives the image incredible warmth. The way it filters through mom's gorgeous lace maternity gown adds a touch of whimsy too. What's more, the inclusion of the surrounding environmental elements - the trees, shrubs, and cacti - add a level of depth and detail that would be difficult to achieve indoors. But keeping it natural also refers to the manner in which the mom-to-be is posed. The last thing you want to do is make your subject twist and turn herself into unnatural poses that will probably look odd anyway. Instead, go for poses that are comfortable for her. In the image above, a simple standing pose with her hands on her belly gives this soon-to-be-mom a relaxed, natural appearance. Besides, often, the simpler the composition and posing, the more viewers will engage with the primary subject. So, trick number one is to rein yourself in, do more with less, and keep the composition and posing relaxed. If you've looked at a fair amount of maternity photography, you've no doubt seen images in which mom and her partner are separated in the frame. 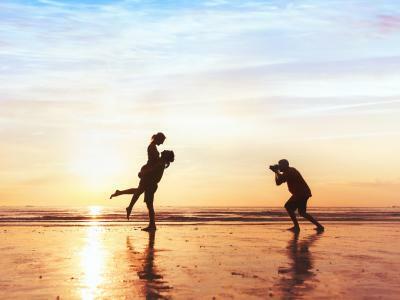 Though this can make for a more unique photo, typically, you'll want to keep couples close. That doesn't mean you have to force the couple into a formal or awkward pose, either. In the example above, even though mom is wearing a formal-looking maternity gown, having dad turn his back toward the camera offers a unique twist on a couples shot that's a little less formal. And by having their arms interlinked, you create a visual connection between mom and dad that makes for an intimate maternity shot. In a more classic approach, you might minimize the space between mom and her partner even more. As seen in the image above, having the couple sit together forms a much lengthier visual connection between them. Also, unlike the previous example in which the models were looking at one another, in this example, mom and dad are both looking down at mom's belly. Again, this is a visual trick that helps us feel the connection between the couple and their coming child. If it's an intimate portrait that you're after, have the couple touching. But remember, it doesn't have to be a lot of contact to get that strong visual connection. As with a lot of portraits, having mom outfitted in a flattering wardrobe helps give her the confidence to feel pretty while also adding a visual element to the shot that adds interest and helps draw the viewer's eye toward the mom-to-be. In the example above, you can see the impact of the gown's deep, saturated color. Not only does it contrast beautifully with the more muted colors of the surroundings, but the mustard color is eye-catching and immediately draws one's attention to the model. The manner in which the gown is constructed - with an opening in the front to allow a view of her belly - also allows the model to use the gown as a prop. By extending her right arm, she shows the volume of the gown while giving the image a greater sense of elegance at the same time. In this example, we again see how the wardrobe can make or break the shot. In the previous example, the maternity gown sported a deep, saturated color that was eye-catching, but the gown itself had an understated elegance. In this example, the gown takes on a much more central role in the photo because of the plain background in the shot. Since there's nothing for the gown to compete with for our attention, you can get away with making wardrobe choices that have much more detail. In this case, the flowing layers of the gown add a lot of dimension to the shot while the color - though perhaps muted - still contrasts gorgeously with the surroundings. When helping mom choose a gown for her portraits, consider not just how it fits and how it looks on her, but also the color, shape, and texture of the gown and how those features work with the surroundings. When taking maternity photos, you naturally want to have a fair share of images in which mom's belly is on full display. But to give some variety to the collection of photos, there's a need to focus on other elements as well. In the example above, you can't even see mom's belly - and that's okay. 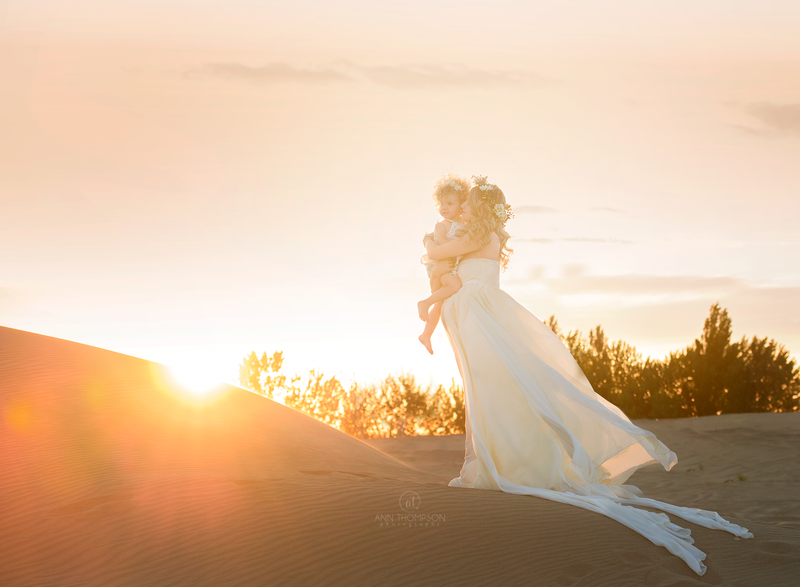 Instead, you get to see the connection between her and her child, which is certainly a worthy subject for maternity photography. Notice as well how the use of the wardrobe draws your attention to mom and daughter, much as it does in the other photos above. In this case, the contrasting colors of their dresses gives the image a great deal of visual interest without distracting from mom's or daughter's face. Another way to approach maternity photography is to put mom in the context of a larger scene. Above, the model's belly is visible, but the shot isn't just about the belly bump. Instead, we have a beautiful, natural scene in which mom has been placed, creating a relaxed photo that's perhaps more about mom and less about pregnancy. Again, not every single photo you take needs to be of mom staring at her belly. By sprinkling in other types of poses and compositions, you can give your subject a wider range of photos that make the collection of images as a whole more interesting and cohesive.